Those are the words of Takanini Community Church’s identity statement. In this sermon series, I am looking at some biblical passages which highlight the ideas expressed in that identity statement. One of the most helpful ways to stay unified as a team is to make an identity statement which expresses what everyone on the team wants. Then all of the team’s potential decisions and actions can be judged by whether of not they agree with the statement. Any team needs to be evaluating itself based on the priorities that the whole team shares as a unit. But, if the team actually happens to be a Christian church, then there is another question which is just as important as the unity question: “Is it biblical?” Through this series, I want to show that our identity statement reflects what the Bible teaches that we as a Christian church should be doing. I want to demonstrate that the decisions we make or plan to make fit into God’s purpose for us. 17 From that time Jesus began to preach, saying, “Repent, for the kingdom from the sky has approached.” 18 While walking by the Sea of Galilee, he saw two brothers, Simon (called Peter) and Andrew his brother, casting a net into the sea, since they were fishermen. 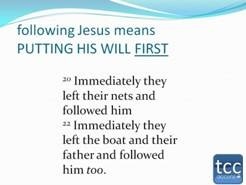 19 And he said to them, “Follow me, and I will make you into fishers of people.” 20 Immediately they left their nets and followed him. 21 And going on from there he saw two other brothers, James the son of Zebedee and John his brother, in the boat with Zebedee their father, repairing their nets, and he called them. 22 Immediately they left the boat and their father and followed him too. 23 And he went throughout the whole region of Galilee, teaching in their synagogues and preaching the gospel of his kingdom and healing every disease and every illness the people had. 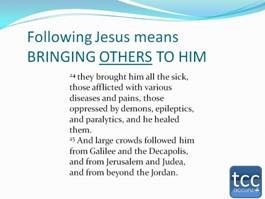 24 Gossip about him spread throughout all Syria, and they brought him all the sick, those afflicted with various diseases and pains, those oppressed by demons, epileptics, and paralytics, and he healed them. 25 And large crowds followed him from Galilee and the Decapolis, and from Jerusalem and Judea, and from beyond the Jordan. Since, we – as a church – have identified ourselves as believers seeking to follow Jesus Christ, perhaps it is a good idea for us to consider what it means to follow him. We should ask ourselves what following Jesus entails. We should investigate what it meant for people in the New Testament era to make a conscious decision to follow Jesus. I think we will find that today’s text will be very helpful in answering that question. First, notice in this passage that following Jesus means letting him change us. We see that in the short, direct statement that Matthew makes which summarizes Jesus’ gospel message. He says that Jesus was preaching that people should repent (17). Dr. Flannigan explained something very important recently about this concept of repentance, and how it is necessary for true biblical faith. In his message on Psalm 32, he talked about some people’s wrong understanding of what it means to have faith in Christ. Some people think of faith as merely assenting to the reality of Christ’s existence. But, if that is my idea of faith in Christ, I will find it very difficult to find a reason to repent of my sins. If all God wants from me is to believe that Jesus is real, why does Jesus insist that I also have to repent? He explained that in the biblical mindset, repentance and faith are two parts of the same thing. To believe that Jesus is the Messiah (Christ) is to accept him as my ruler, my king. Dr. Flannigan said that the word Messiah is a political term. In fact, the word Saviour is also used in the bible with the same connotation. A Saviour is a king who rescues a people and delivers them from slavery to another king. So, the gospel message is not so much a religious doctrine as it is a political statement of God’s intent to rule through his Saviour (Jesus) Messiah (Christ). And that is why you cannot truly believe in Jesus without repentance. For the same reason, it is also impossible to truly follow Jesus without letting him change you. That is also why Jesus’ message was a challenge to repent. Repentance is a change of mind that produces a change of conduct. In today’s text, we see Jesus approaching four fishermen – two sets of brothers – Peter and Andrew and James and John. All four of these brothers had heard Jesus’ message and had personally repented. They had both accepted what Jesus said was true, and also pledged their lives in loyalty to him. That explains why all four of them were able to respond so quickly to his personal call to be his disciples. He told them “Follow me, and I will make you into fishers of people. They were learning something very important about repentance – something that you and I need to understand as well. Repentance is not a “one shot deal.” Those four brothers that day had already repented. If you and I were there that day, and we asked them whether they belonged to Jesus, they would have said yes. But Jesus did not approach these four and ask “are you mine?” No, he knew they were his. But he was not through with them. It was not enough for Jesus to merely have them on his team. He wanted to change them. So, he told them to follow him, and as they did so, he would make them into something different. They were currently believers who were fishers of fish. He was going to change them into believers who were fishers of people (19). Now, if you and I are serious about our Christian walk we will have times like this as well. But, if we are not careful, we will miss out on the opportunity to grow that these times give us. Note, that these four men responded by accepting Jesus’ challenge, and allowing him to change them into something else. Either of them could have said, “No, Jesus, I’m comfortable with my spiritual gift of fisherman, so I am just going to stay on my boat and be a good Christian here.” Neither of them said that, and neither of us should. 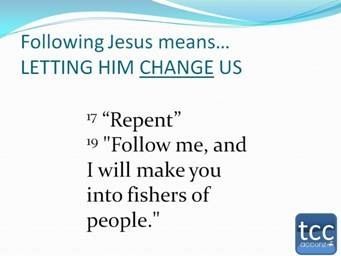 Following Jesus means being willing to keep repenting and allowing Jesus to change us into the kind of people that he wants. Christianity is not so much an club we are recruited into as a life career we are in training for. That explains why these four fishers of fish could so easily and immediately transition to a new task: being fishers of people. It was not that they had gone to theological seminary and graduated with a Masters in applied evangelism. No, the jumped off their boats and followed Jesus into a life they were totally unprepared for. If you had asked Peter of Andrew of James or John whether they felt able to accomplish that task, each of them would have said “no way.” But their commitment to follow Christ was not being measured by their own sense of ability or qualification. They had determined to follow Christ and live out his teaching. That meant putting his will first. Matthew goes on to record the actions of another group of followers of Jesus besides these four beach boys. He said that large crowds of people were following Jesus (25). What were these followers doing? They were not being trained as apostolic evangelists. But they found a way to be fishers of people also. Notice that these believers scoured the countryside, looking for broken people for Jesus to fix. You know why some churches die? Some churches die because their members keep looking for more healthy members to help them grow their church. Those who are healthy do not need a doctor. Growing churches are made up of crowds who follow Jesus into their neighbourhoods and look for more people who need Jesus as much as they do. These crowds in today’s text were full of followers. They were not going to be involved in intensive training like the twelve. So, there was going to be a lot about Jesus that they would not know. But there is one thing they understood instinctively: Jesus is the answer. At some point in time, they had heard the gospel message that Jesus was preaching. They knew that God’s kingdom was going to come down from the sky. They knew that they wanted to be part of that future kingdom. So, they obeyed Jesus and repented of their sins. That choice to repent and follow Jesus drove them to a thousand other choices. They did not decide to gather together and form good worship teams and bless themselves with a deeper religious experience. No, their faith in Christ did not lead them to be internally focused. It made them into people who were externally focused. From that time on, when they saw someone who was sick, diseased, in pain, demonically oppressed, physically or mentally challenged, they no longer saw those people as cursed. They saw all of the broken people as potentially blessed by the same Christ who saved them. 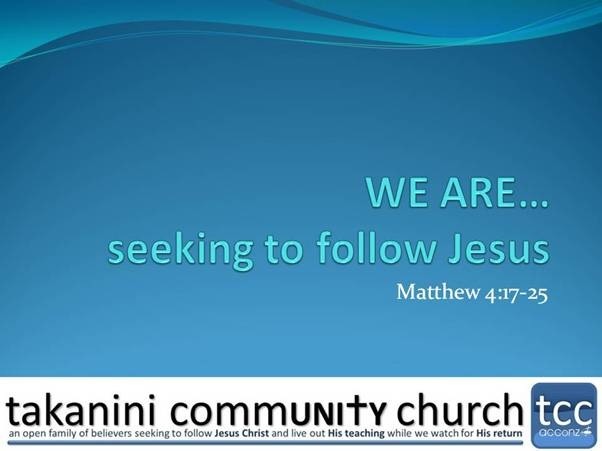 We at Takanini Community Church are also committed to bringing the Takanini community to Christ. All of our community ministries are designed to meet people at their point of need, and introduce them to Jesus. When we see a young, single parent, struggling to raise children, we don’t look at that parent as someone else’s problem. We see that parent’s need as a possible way of introducing them to Jesus. We don’t see those children as problems either. They are a blessing, because they can be the focal point of a ministry that leads their whole family to Christ. We have just barely begun the process of seeking ways to bring our community to Christ. But we have begun. The point of today’s text is that this process of seeking out the broken for Jesus to heal is not some sideline specialty for professional Christian workers. It is the work of the larger crowd of followers of Jesus. Our commitment to follow Jesus is not like the decision to join a casual club. We are not just members who join by being baptised, pay our annual membership fee and then watch the professionals do the work. No, the Christian life requires letting Jesus change us so that we accomplish what he wants. And it also requires of us all that we make it our full-time work to find ways of bringing the broken in our community to Christ. Those are things that true followers do.